Exercise (or increased activity) can have a measurable impact on blood glucose values right away or hours later. 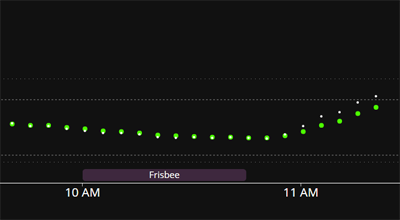 With the Funnel Cake 0.8.2 release, exercise entries made in CarePortal are visualized on the Nightscout graph as purple blocks. 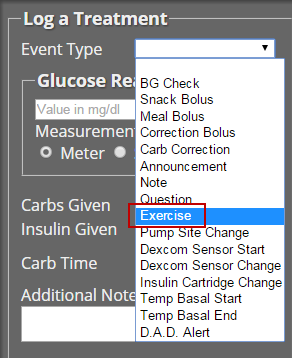 To log a period of exercise (however you define it), choose Exercise from the Event Type dropdown menu in CarePortal. With the 0.8.2 release, available fields for a CarePortal entry automatically update based on the selected Event Type. 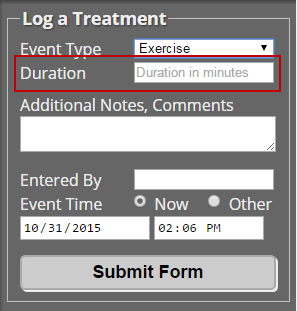 After selecting Exercise as the event type, fill in the information about the exercise block to create the entry: duration (in minutes), note (type of exercise/activity), time (when the exercise block begins), etc. After logging an exercise entry, the event will be shown as a visual block (purple) on the graph with a label taken from the note field of the entry. Hovering your mouse over the exercise visualization will raise a popup tooltip with additional information. Note: duration should be entered in minutes. If duration is left blank, the exercise entry will be recorded as a CarePortal entry but will not be shown on the graph as a visual (purple) block. Need to Make a Correction? 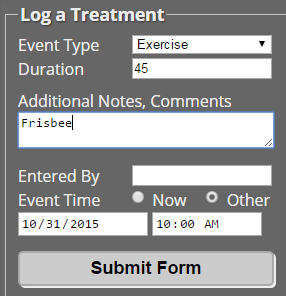 You can edit exercise entries from the Treatments screen of the Reports section.